Give a lovely surprise to your loved one on Valentine's Day with this gift of You are My Life Valentine Hamper and create magical moments to cherish forever. 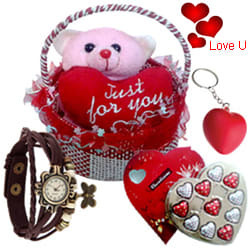 This Gift Hamper is included with a beautiful Teddy in a Basket, an awesome Velvet Red Rose, 11 Pcs outstanding Heart-Shaped Chocolates, a fantastic Butterfly Watch and a lovely Heart-Shaped Key-Ring. Flowers Delivery Karimnagar, Send sweets Kozhikhode, Wedding Cake Bhubaneshwar, Diwali Mithai Alwar, Send Flowers and Gifts to Vadodara, Online Shop Haveri, Flower to Mangalore, New Year Flowers Viruthunager , Fresh Fruits Thiruvanthapuram, Send Gift Lucknow, Dry Fruits to Bokaro, Birthday Delivery Buldhana, Sending to Meerut, Flower shop Ichalkaranji, Sawai Madhopur Online Cake Delivery.